With the new IWB Clip Tuckable concealment holster, you’ll get two great concealment holsters in one. Wear it as a maximum concealment holster with the shirt tucked in between the holster body and the belt clip so your gun is completely concealed. Or wear it with a jacket or sweater as a fast access, inside-the-waistband holster. 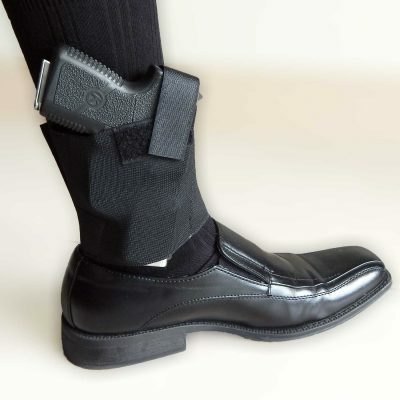 Great if you need to put on and take off a holster quickly, without having to remove your belt. Can be positioned anywhere around your waist, including strong side, crossdraw, and appendix positions. The IWB Clip Tuckable concealment holster for Concealed Carry is a quality concealed carry holster designed for no-nonsense, practical everyday use. MULTI-POSITION: The IWB Clip Tuckable Concealment Holster carries your gun vertically with no cant or angle, so it is great for appendix carry, strong-side (2, 3, and 4 o’clock) and crossdraw (11 o’clock) carry. BELT CLIP: Heavy-duty black spring steel clip keeps holster secured to belt or waistband. BELT: Fits up to 1¾” belts. The Self-Defense Guideline Card! The seven steps you must take to keep you from going to prison if you ever have to use your gun in self-defense. This card reveals, step-by-step, exactly what to do after the confrontation ends and the confusion begins. It contains vital information to protect you! If you carry a gun for protection, you can’t afford to be without this card. Get your card absolutely free, just by trying the IWB Clip Tuckable concealment holster for Concealed Carry —at no risk to you! I HAVE SEVERAL OF YOUR PRODUCTS. VERY PLEASED. AM RETURNING THE LASTEST ONE BECAUSE I COULD NOT WORK THE BELT CLIP. TOO STIFF AND MY OLD FINGERS AREN’T AS NIMBLE. WILL SEND IT BACK AFTER THE HOLIDAY RUSH. STILL A SATISIFIED CUSTOMER. KEEP SENDING THE EMAILS. I am not sure I will use this holster as it will not fit easily inside the waistband of the jeans I have. I can see how the holster would work fine with trousers or shorts which often have expandable an waist built in or are made with fabric that is not as stiff as denim. But my jeans don’t stretch and with my skinny build I don’t think buying jeans with a waist size 2″ larger would look right. It probably doesn’t help that my belly sticks out either. Oh well, that isn’t the holster’s fault. The holster is nicely designed and made and fits my small revolver perfectly. The quality is great. I might use it after all but have also bought a fanny pack with a built in holster and an OWB clip on holster that I can use comfortably although obviously not as concealable. Works well, conceals without a problem and give you options. Bought one from you guys at a gun show at the beginning of the year. Have now ordered 2 more. Works well for me. I recommend it. The holster itself I love. I take away a star just because I wish the clip was smaller.